The Horizon Fitness Adventure 5 Treadmill is On Sale! The Horizon Adventure 5 treadmill includes several Interactive features like ViaFit and Passport that are geared to motivate you towards your fitness goals and add excitement to your workout. In addition, this machine comes with the quality components and engineering that Horizon is known for. Horizon Fitness treadmills compete aggressively as some of the best value within their price range. They come from the same company that brings us premium Vision Fitness and commercial Matrix Fitness treadmills. 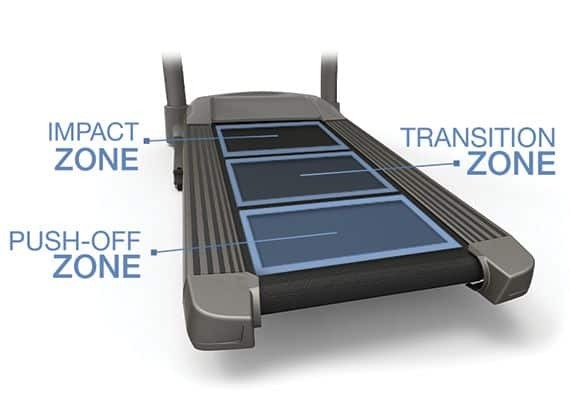 ViaFit —ViaFit allows your Horizon Adventure 5 treadmill to communicate through Wi-Fi with the Internet. It connects with your online ViaFit personal account, so you can track your workout data and make better progress towards your goals. With the ViaFit app, you can define fitness goals like number of workouts, calories burned, amount of time exercising or total distance. As you workout, your stats are uploaded to your ViaFit account and you can track your progress. In addition, ViaFit is compatible with a number of tracking apps found on smartphones, so you can combine your stats from numerous fitness, nutrition, and health applications. Studies show those individuals that track their progress are more likely to achieve their fitness goals. In comparison to iFit Live, found on NordicTrack and ProForm treadmills, ViaFit is Free! Passport — This feature allows you to simulate running outdoors through famous landscapes. Your Horizon Adventure 5 treadmill can connect to your TV and provide high-definition destination footage displayed on your large screen which is synced to the speed and intensity of your workout. You have to purchase the Passport box at an additional cost. 2.5 HP Continuous-Duty HP Johnson Drive System Motor – The motor is specifically built by the parent company, Johnson Fitness. It runs at a lower RPM, making it run cooler and quieter. In contrast, most other treadmill companies install a third party motor. The motor in the Adventure 5 is more than adequate to handle walkers, joggers, and runners. It runs on a digital drive system so it is responsive to your desired speed changes and runs smoothly. Display – The display on this machine is more sophisticated than its younger brother, the Adventure 3. The Adventure 5 has a 7.5” Extra Wide Blue LCD screen. 35 Built-In Workout Programs – The Adventure 5 offers a wide variety of workouts from which to choose. They focus on different fitness goals like burning calories, speed training and distance. There is also a manual, 3 Interval training and 2 Custom programs. Alternate among your favorite workouts to keep you motivated and on track towards reaching your desired fitness goals. 20” x 60” Treadbelt – Compared to the smaller Adventure 3 model, this treadmill is longer and more suited to runners or taller individuals. 325 Lb. Maximum User Weight Capacity – Like most manufacturers we feel this is pushing it. We would put the weight limit at around 260 lbs. Variable Response Cushioning – The deck of this machine is softer in the front to absorb the impact of your step. The rear of the machine has a firmer service to provide a stable place to push off with your foot. This system makes the Adventure 5 quite comfortable to run on. Easy To Fold – This is an especially nice feature for people who have limited space in their homes. With little effort, you can fold this unit to store it after use. Once released, the deck descends slowly and safely to the ground. Speakers with iPod Input – The sound will not match your home stereo, but is provides the benefit of having the sound directed right at you. Cooling Fan – This is a popular feature and the benefit is the breeze is pointing right at your core. Up to 12 MPH Speed Capacity And Up To 12% Incline Capacity– Notable is the 12% incline. Most treadmills at this price range only go up to 10%. At 12% you will get an intense cardio burn that will leave the calories in the dust. Warranty – The Adventure 5 treadmill has lifetime warranties on its frame and motor. You also get 3 years parts and 1 year labor coverage. Overall, the Horizon Adventure 5 is a solid machine for moderate runners to train with a nice variety of workout programs. The ViaFit and Passport take it a step above some of the competition at this price point. With all Horizon products, you can be sure you’ll get quality parts and responsive customer service. To compare the Horizon Adventure 5 to the Horizon Adventure 3, there are three main differences. The display on the Adventure 5 is larger with a blue LCD screen. The deck on the Adventure 5 is 5” longer to accommodate runners or taller individuals. Finally, the machine includes 5 extra programs not available on the Adventure 3. This is all for a $300 increase in price. 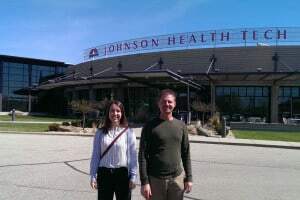 We had the opportunity to visit the Johnson Fitness North American headquarters and were very impressed with the whole operation and the commitment of the employees. They have made vast improvements in their quality control and engineering in the last several years, and that has resulted in offering some of the best treadmills in their price range. With the release of ViaFit and Passport they are now firmly at the forefront of offering quality treadmills with leading edge technology. The Horizon Fitness Adventure 5 treadmill is a perfect example. Visit HorizonFitness.com to learn more.